The room was nice and the breakfast was excellent. The mattress could have been a little firmer, though. Air Conditioner unit shut the compressor all the way down. In order to have the fan on all the time, we had to turn off the compressor. I would rate this hotel as more of an economy hotel. The staff were cooperative but the motel is getting to the age that some cosmetic renovations would do it a world of good. The continental breakfast was billed as a deluxe, but it was like any other that I've had. Our experience there was okay, adequate, but not outstanding. The rooms, which are supposed to be non-smoking rooms, were not, however they did not have a smoke smell. The layout of the motel was not convenient. This hotel was perfect for the price we were paying and the closeness to the Convention center. The pool was great for my husband and son as I was attending a 4 day convention. The bathroom fan was way too loud for my taste, and the water pressure for flushing was not adequate. There was a leak in the ceiling of the breakfast room, which was a little small and the selection of breakfast choices was a bit slim. But considering how close it was and what we paid per night, I'd gladly stay here again for the convention next year. Closeness to the Convention Center, very inexpensive. 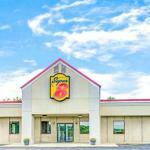 The pet-friendly Super 8 Indianapolis South is one mile from the University of Indianapolis and provides budget-priced accommodation for both the business traveler and vacationer. Items included with the room rate at this single story motel are high-speed Internet access, a hot breakfast buffet, in-room coffee and parking. The property has easy access to Interstate 465. Area landmarks and attractions include The RCA Dome, Conseco Fieldhouse, the Indianapolis Zoo, Indiana Convention Center, Lucas Oil Stadium, Indianapolis Motor Speedway, the Children's Museum, the Indianapolis Museum of Art, Indiana State Fairgrounds, White River State Park and shopping at the Circle Center Mall. The rooms come with a choice of one king size or two queen size beds. The amenities include high-speed Internet access, television with cable news and movie channels, an iron and ironing board, hairdryer, coffeemaker and an AM/FM clock-radio. This motel has an outdoor swimming pool, patio area and ample parking space for all size vehicles. The 24-hour front desk has information on area attractions and events. The complimentary breakfast, which includes hot Belgian waffles and biscuits with sausage gravy, is the only meal served here. There is a Bob Evans and Dennys next to the property. Other restaurants nearby include a Hooters, Joes Crab Shack, McDonalds, an Old Country Buffet, Red Lobster and an Outback Steakhouse. Those on a budget who have stayed at this Super 8 say it proved ideal. The location is good, just a few minutes drive from downtown Indianapolis, and the rooms here are clean and comfortable. Many guests enjoyed the complimentary breakfast and particularly the biscuits with sausage gravy. There were good reviews too for the happy team of employees who shared their local knowledge about shopping and dining. Not everyone had a good time. Some guests said they were disappointed with the breakfast sand said they would spend a little more next time for additional space and comfort.